In 1968 the Neuchâtel Observatory wrist watch chronometer competition was cancelled, but the Observatory still continued to accept movements for general testing and certification as chronometers. During this year Daini-Seikosha submitted submitted 103 examples of the caliber 4520A movement, of which 73 were awarded chronometer status. These movements were the standard 45GS caliber that were taken from the general production run and then specifically regulated for optimum performance. Once certified these 73 movements were housed in an 18K gold case with a matching gold dial that has a linen textured pattern. All of the watches were sold to the public and the associated Neuchâtel Observatory certificate was provided to the owner from Seiko when the warranty registration was completed. The watch was labeled prominently on the dial “Astronomical Observatory Chronometer Officially Certified”. The watches were sold to consumers through key Seiko dealers for ¥180,000 and it came on an alligator strap with solid 18K buckle. You will notice that the model number is 45GSN which presumably references 45 Grand Seiko Neuchâtel. In a description of the product for dealers it explains the product has passed the strict testing procedures from the Swiss Neuchâtel Observatory and that it is “Designed with the theme of precision and high standards, this watch is definitely for people who know the weight of time.” Seiko’s outstanding technology and strict quality control is attributed for the success of the product. One interesting comment comes at the end of the description where they state “In addition, please return the manufacturer warranty registration card to us at the same time as selling. 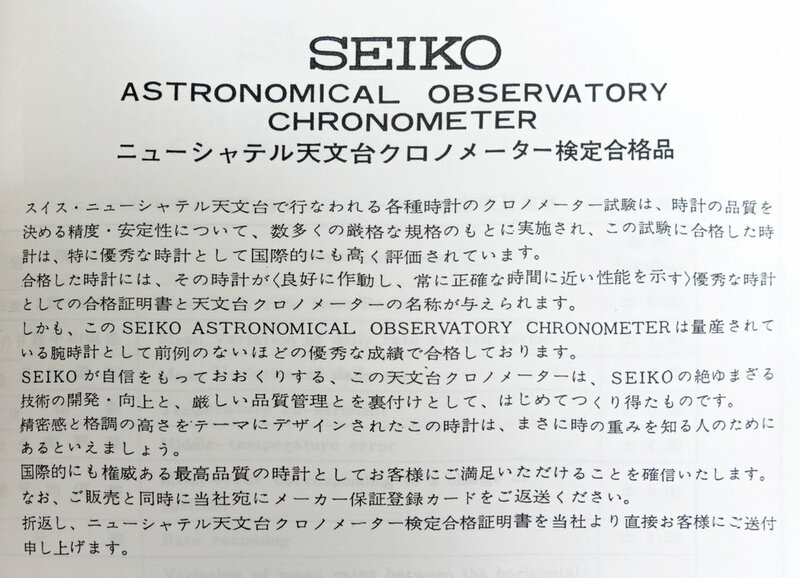 We will send you a new certificate of certification of the Neuchâtel Observatory Chronometer Test directly to the customer.” This would indicate that the certificates were provided to the customer directly from Seiko and not with the watch at the time of purchase. The following summary table was also included for the watch. These movements were significantly different to the highly specialised competition movements, like the caliber 052 “Potato”, that Daini-Seikosha had designed for the Neuchâtel Observatory competition. Despite their obvious differences some of the technologies that were fine tuned for the competition chronometers were employed in the design for the consumer movement. One commonality is the large full width bridge to hold the high beat balance and provide greater stability when compared to a traditional cantilever bridge. The full width bridge was also employed on the earlier 44GS movements that would have been in development around the same time as the 052 competition caliber so it is likely that the techniques to best manage a high beat movement that were learnt from the 052 were also employed into the design of the 44GS and 45GS movements. Despite a few commonalities, the level of performance between the consumer model and the specialist competition model is significantly different. Below is a table comparing the 4520 Astronomical Observatory Chronometer movement that was submitted to Neuchâtel in 1968 and the Suwa R-67 competition movement from the same year also submitted to Neuchâtel. Note the competition chronometers submitted to Geneva the same year significantly outperformed the example below. The figures quoted above in the middle column is for the best performing example of the 4520A that was submitted in 1968 (serial #004928). With an N-Score of 5.80 this example if entered into the chronometer competition the previous year, the watch would have been ranked 173rd in the competition. If the competition had been held in 1968 it is highly likely the ranking would have been even lower. The average of the 73 watches that achieved chronometer certification is shown in the right column and they had an N-Score of 10.73. This would have been positioned at 282nd in the 1967 chronometer competition. As noted above Daini submitted 103 examples of the 4520A movement of which 73 met the criteria of an Observatory Chronometer. The specifications for the testing criteria to be awarded this certification are listed in the table below. If a watch had just met the criteria above it would have achieved an N-Score of 42.45. To put this into context against the wrist watch competition chronograph submissions from the previous year (1967), the 900th placed entry had an N-Score of 24.43. While the Neuchâtel Observatory certified chronometers did not come close to the performance of the competition models it is highly unfair to compare these directly. The Seiko Astronomical Observatory Chronometer was designed to be a watch that could be worn everyday and was expected to have the lifespan of a normal high quality watch. The competition models were custom made just for the competition and did not have features like shock protection as they were never required to hold up to the everyday demands placed upon a standard watch. Trying to directly compare them would be similar to trying to directly compare a Porsche 911 to a Formula 1 car. The 911 is a very nice and great performing car that can be used as an everyday driver. The F1 car has much higher performance but would be totally impracticable as a general road car. After selling the initial 73 units to the public in 1969 Daini-Seikosha went on to submit 30 examples of the newly updated caliber 4580, of which 25 were awarded chronometer status and in 1970 they submitted another 150 caliber 4580 examples and 128 of these were awarded chronometer status. All the movements that were awarded chronometer status were cased and sold to the public as the Seiko Astronomical Observatory Chronometer (45GSN). This brought the total number of chronometer certified examples to 226. The 4580 models can be identified by the numeric stamping 4580 on the main plate below the balance wheel. The 1968 4520A movements have the caliber engraved on the bridge plate and the serial number also engraved on the bridge is stamped into the mainplate below the balance wheel. The dial codes for all models states 4520-8020T. Summary of movements submitted and awarded Observatory Chronometer certification. The Seiko Astronomical Observatory Chronometer is a rare and highly desirable vintage model. These do appear for sale occasionally as you would expect from a limited edition with 226 examples. These are not the only models with a Swiss Chronometer certification that Seiko has sold. Thirty years after the submission of the 4520A movements for certification in Switzerland, Seiko produced two Limited Edition Credor models that also contained a Swiss certified movement. In 1998 the Credor GBAY992 and GZAY999 models were released. The GBAY992 was a limited edition of 500 units that came in a yellow gold 18K case, and the GZAY999 was a limited edition of 20 units in white gold that was produced for a Japanese retailer. These two models are based on a Credor 4S78 movement that was specially regulated, then sent to Switzerland for COSC certification. Each of the models were provided with the official COSC certificate. It is extremely unusual for a non-European watch to be COSC certified, so these models are quite unique. After these watches were released Seiko started the modern Grand Seiko certification process that is stricter than the COSC testing, so these were the last of a very small number of Seiko models to be supplied with a Swiss Chronometer certificate.